Onboarding done right. Surprise, it’s a challenge! In fact, a quick peek at employer review websites can tell you a lot about the value of onboarding. Dating is similar. First impressions matter. But that’s the interview. The love affair starts with onboarding. Onboarding done right leaks when measuring quality of hire. If you’re not HR, quality of hire is a trendy metric to track. While tough to calculate, it does provide valuable insight. It is also a gateway into building a system of metrics on which to plan improvement goals. Quality of hire factors in various items. Indicators such as job performance, ramp-up time, enthusiasm, cultural fit and more. Fear not, we won’t attempt to do a math model of quality of hire. What is important to know is that onboarding and quality of hire correlate strongly. Also, there’s a greater chance for quality of hire to go up with great onboarding. Firstly, a decreased ramp-up time is a consequence of proper onboarding. Actually, onboarding is the first step to decreasing ramp-up time. Secondly, team fit and organizational fit develop while onboarding. People get to know each other and become friends. The list could go on, but it’s better to put it all into context. After a series of interviews and tests, a larger pool of candidates gets trimmed down to only a few hires. Next step is going through a lot of paperwork. And when your first day at the new job is a lot of paperwork, you’re likely not that happy. While nobody likes paperwork, some people love to give advice. Hence starts an abundance of advice dumped at you from all over. Since you can’t process most of it, it must be hazing. It’s not; it’s just bad onboarding. Lastly, you get to meet your team. Finally, you catch a break by trying to memorize the names of your 20+ new teammates. At home, you have about 20 booklets and other materials to study. Much of it is about the company. The amazing CSR policies they have. And plenty of other stuff you already read before going to the interview. You don’t want to keep studying. You go to bed after not having read the important bit. Next morning, sadly, you start all over. It’s hell week for you, and your teammates suspect you’re wired like this. Anxious, tired. Slow to catch on and catch up. If only your HR managers would’ve read this piece on how to do onboarding the right way. Doing onboarding right begins in the mind. You need to consider the above-mentioned mindset of your new hire. Also, your new hire does work that is more than a means to an end. And is passionate about the work, not about the paycheck. Conversely, you should rest assured, your new hire knows all about your company. Firstly, consider the needs of your team and your new hires. Secondly, build a timeline focused on developing value. Thirdly, consider what you aspire to achieve. What is the purpose of the whole process? With these in mind, let’s go through a more detailed check-list. Remember, onboarding is training. You can achieve anything with the right training. Some argue that the perfect day for onboarding is Friday. The reason? People anticipate the weekend and relax a bit more on Fridays. And a new team member will feel more comfortable. Also, the informational input can better be digested over the weekend. While it sounds reasonable, let’s improve this method. New hires should meet teams as soon as possible. It doesn’t matter if it’s Friday or not. As long as you don’t overload the welcome package, there is no need to digest it. On the other hand, it should be possible to do a minor team-building exercise. While you may not have an in-house trainer, you can easily outsource. After all, micro-training is trending. If you’re using any sort of technology that keeps track of team communications, that’s perfect. Your new hire can go through whatever is available and get up to speed with the people. This balances the odds a bit. After all, the team will already know quite a bit about the new hire. Why? Because you’ll broadcast all the information. It is very powerful to show pride in new hires. Teams become more enthusiastic, more energetic. 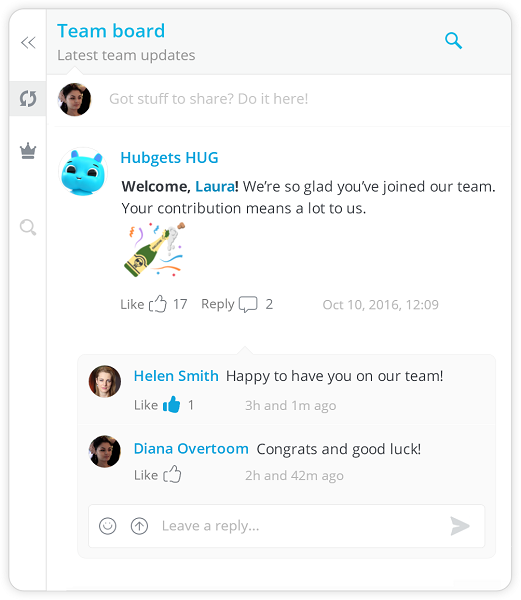 If you’re not using a team collaboration solution already, you should take Hubgets for a spin. All features, from the warm Welcome to the team! message on the Team Board to all shared resources, speed up team integration and job transition processes. Our bot, HUG, sends a welcoming message to each new member on the Team Board so that everyone can personally greet them. New members can be involved in group activities from day one so that they can interact with the team and feel part of it as quickly as possible. They can be invited to join specific Group Topics, depending on the project they are assigned to. This way, they can instantly access the communication developed around it and absorb the information independently. Knowledge transfer takes time, so it’s no use trying to make it all happen in one week. After all, the main purpose is to help the newcomers swim independently as quickly as possible. Because your business productivity depends on it. So, you should ask yourself this: what does your new hire need to know on the first week? That’s precisely what you’re going to offer as a welcome package. I’ve seen this done successfully a couple of times. For instance, here at Hubgets, we make theoretical introductions as short as possible. Even our interns start coding from day one, whereas most of their pull requests get approved to a production branch during their first week. Have someone discuss with the new hire on behalf of the team. This person will be responsible for welcoming your newbie. The orientation will happen with the help of this new person. Sure, choose a charming team member with decent levels of knowledge authority. Also, a mentor should have experience with those 5 trainings all teams should try. Most of all, the mentor should be capable of auditing the onboarding process. The mentor will review the process by asking inconspicuous questions. Use these questions to improve the process. Teams should be actively involved in the onboarding process. After all, the new hires are part of the team. Why not make it so that one of the occasional responsibilities of the team is onboarding? You can set this up by asking each member to work on several items. For example, “Sarah is in charge of all your tech questions”. “Bob is in charge of all your coffee-making questions”. Times are changing, remote work is on the rise. Teams in the traditional sense are dissolving. A lot of the work your team does mixes with a bit of work processed externally. Lack of proper communication can lead to unfortunate outcomes and wasted productivity. It takes a lot more to fix something faulty by design than to design something great from the beginning. So, empower your team with a collaboration tool that allows them to work closely with remote colleagues and collaborators. Hubgets keeps everyone on the same page, even if they’re two oceans away. If you’re aiming for a close relationship with collaborators, but you don’t want to expose your internal communication, you’ll find Page by Hubgets extremely convenient. This interactive business card available for each team member allows collaborators and contractors to reach your team in real-time via chat, voice, and video for free. Hubgets automatically centralizes external communication history and team members can access it in the same interface integrating internal communication flows. Overall, onboarding improves your team cohesion, its productivity, and even your rating as an employer. And it can’t hurt to get it right. Quality of hire is a composite measure, it is a key performance indicator. It tells you how well things are going. How does your team handle onboarding? You’re welcome to share your onboarding experience in a comment below.